As a descendant of Jews, Teresa and her family had been looked upon with suspicion, both by priests and the Inquisition, but deep in her heart she knew that union with God had nothing to do with one's origin or the formalities of the priesthood. She was a true visionary, but she was hesitant to reveal her visions to her sisters at the convent, for fear of all ending up at the stake. With her inner eyes, the eyes of the soul, she was blessed with the indescribable sight of God's Divine Hands and the Divine presence of the resurrected Jesus, in visions whose light was so bright that even the sun would seem dim by comparison. One of the rare souls who evolved through prayer, meditation and contemplation, and having reached a spiritual maturity that is apparent in her scripts, Teresa's experience teaches us how to bring ourselves to "the center" of our being, and acquire integrity and sovereignty as children of God. This kind of evolution is a hard way of perseverance, full of joys as well as disappointments, that goes up the difficult path of perfection, always assisted by the love for God. Following this path of devotion, all other phases of one's life are affected, and only "the prayer of quiet" and the "prayer of unity" are of importance. Saint Teresa was born in a family of virtuous and pious parents, her father Don Alfonso Sanchez was a wealthy merchant and her mother Beatriz, raised her with accounts and stories of the lives of saints and martyrs, to help her daughter become a devoted Christian. However, Teresa's paternal grandfather, who was of Jewish origin, was accused by the Inquisition of having returned to the Jewish faith. That is why her father was always careful with religious matters, he had bought a knighthood and gradually was successfully accepted in the Christian community. Her full name was Teresa de Cepeda y Ahumada and she was born in the Spanish state of Avila on March 28th 1515. Teresa was the third of the nine children in the family and she was very unfortunate when her mother died at childbirth at the age of 34. Teresa was only 14 and she felt desperate for the loss of her beloved mother, who was the mild counterbalance to her father's strictness. The only comfort for her sadness and loneliness was Virgin Mary. In her autobiography Saint Teresa wrote: "I threw myself down in despair before an image of the Mother of God. With many tears, I implored the Holy Virgin to become my mother now. Uttered with the simplicity of a child, this prayer was heard. From that hour on, I never prayed to the Virgin in vain." Santa Maria Della Vittoria church in Rome. As an adolescent, Teresa was considered to be quite beautiful, of fine features and appearance, something she retained to the end of her life. She was especially popular due to her extrovert character, her natural charm and her ability to make friends easily, and she showed remarkable skills in household duties, embroidering and needlework. At the age of 20, she entered the convent of the Incarnation of the Carmelites, but she soon became ill, probably from malaria, and she had to suffer tremendously. During her long period of sickness and pain, she often had moments of deep religious ecstasy, divine visions and long periods of inner peace. When her pains were not so severe, she managed to read several books by medieval mystics that strengthened her faith and gave her the mental courage she needed to overcome her illness. She admitted that it was her surrender to the will of God that made her strong enough to endure so much suffering with so much joy, and manage to transcend the physical pain. However, when some of the clergy suggested that her visions and inner state of ecstasy were not divine but delusions of the devil, she applied mortification tortures upon herself for several years, and lost her confidence in her prayers. Her spiritual life was almost ruined, and it was only when her confessor, Saint Francis Borgia, reassured her of the divine nature of her visions and experiences, that she regained confidence to resume her prayers. While difficult at first for her to concentrate, her visions came back and on St. Peter's Day, 1559. Teresa said that Jesus appeared to her in his bodily form, and continued to appear to her for the following two years. A seraph also appeared to her, driving his golden lance through her heart causing her a mixture of physical and spiritual pain. 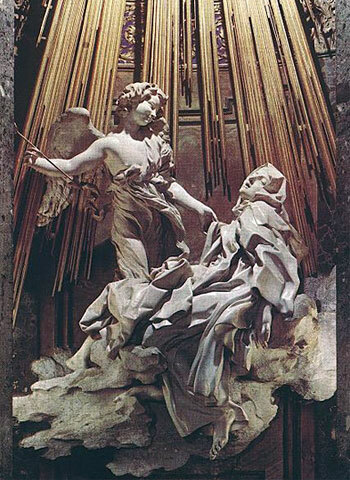 That was the experience that inspired Bernini to create his famous sculpture The Ecstasy of St. Teresa, which can be seen at the church of Santa Maria della Vittoria, in Rome. Her inspiration and faith increased more as Teresa met Peter of Alcantara, who was a pious Franciscan priest, who became her spiritual guide and greatly supported her in her decision to found a new, reformed Carmelite convent. Her vision was to base the new convent on love, poverty and simplicity, something she could not find in the convent where she lived. It was established in 1562 and she named it St. Joseph's convent. She proved to be a charismatic leader and always guided the nuns with love and reason, away from punishment, strict asceticism and blind obedience. She said: "You know, I no longer govern in the way I used to. Love does everything. I am not sure if that is because no one gives me cause to reprove her, or because I have discovered that things go better in that way. The important thing is not to think much but to love much and so do that which best stirs you to love. Love is not great delight but desire to please God in everything." For the rest of her life, and ignoring her frail health, St. Teresa travelled around Spain and set up several new Carmelite, reformed convents despite criticism and opposition. Also, with the help of John of the Cross and Anthony of Jesus, two reformed houses for men, the Discalced Carmelite Brethren were established in 1568. She died on October 4th 1582, and a fellow sister wrote about her last moments. "Her facial expression was so wondrously changed that it looked like a celestial body to us. Thus immersed in prayer, happy and smiling, she went out of this world into eternal life." Teresa is a Christian mystic who was full of divine inspiration, and left behind some illuminating works, such as her Autobiography, in which she describes the process of ascension of the soul. She herself, had often experienced such a supernatural, ecstatic state of trance and it was said that even her body levitated during Mass. In her Way of Perfection, she guides and advises nuns on how to perform mental prayer and follow the path of union with God and in her Interior Castle, the inner path is described as a castle with seven mansions, something that is similar to the seven heavens of many other mystical works. The farther away the soul is from the central mansion, the darker its environment is. The closer it gets to the central mansion the brighter the place gets. The seventh mansion, the one with the most splendour and the brightest light, is the abode of the Glorious Lord and the final destination of the ascending soul. She has also left some smaller works, such as the Exclamations and the Concepts of Love, several volumes of extraordinary poetry and a lot of letters written to help and guide her sisters at different convents. St. Teresa's writing is top ranking in Spanish prose because of its coherent thought, its loving and graceful tone and its power of expression. She was canonized in 1622, and in 1970, Pope Paul VI awarded her the title of "Doctor of the Church" for her contribution to the development, understanding and interpretation of the Christian doctrine. The best conclusion for Saint Teresa and her enlightened spirit, would be one of her most famous poems. In its few lines, the attitude we all should have in life is perfectly described.